Michelle Gladish and Christina Loveland-Dupuis have a passion for helping people using non-traditional methods of healing and caring. They are both trained doulas, herbalists as well as certified thermographers. Michelle is also a certified medical assistant at Bridgton Hospital. The work they do is steeped in tradition. “It’s a different approach to healing,” said Loveland-Dupuis. Thermography, also call Digital Infrared Thermographic Imaging (DITI), uses digital pictures taken of the whole body or a section of the body to help diagnose and detect inflammation and disfunction in the body. “It detects when the body’s not performing the way it’s supposed to,” she added. One of the most helpful benefits for clients is to monitor breast health. Thermography can detect abnormalities in the breasts for men and women years before a mammogram can, Loveland-Dupuis said. “There is no radiation, no pain. You sit on a chair and the camera does all the work.” It’s a great way to detect areas where a client should seek additional testing from their general practitioner and it can be used to support a diagnosis to insurance companies. The scans taken at Dragonfly Integrative Health are sent to doctors in Florida for interpretation and conclusions, which are sent back to Loveland-Dupuis and Gladish within a week, to review with patients. The doctors look for patterns in the colorful pictures to see where the scans might not be symmetrical. “Breasts are all like fingerprints, all different,” she added. Thermography can help discover diverticulitis, thyroid issues, varicose veins, fibromyalgia, TMJ, sinus congestion and muscular pain, to name a few. The technology has been around for years, but is relatively unknown to a large segment of the population. Most traditional doctors are taught to treat the illness. “Education is part of it. Doctors don’t have time to do the research on their own,” said Loveland-Dupuis. “They got into it because they wanted to help people.” Insurance companies dictate the equipment to be used and the timing of tests. A woman who has a history of breast cancer in her family, should not have to wait until she’s 40 years old to get a baseline scan of her breasts. Insurance companies do not cover thermography, but that doesn’t stop Dragonfly clients from taking their health screenings into their own hands. Both women work with area practitioners to get clients the services and treatments they need. This puts people in charge of their own healthcare. 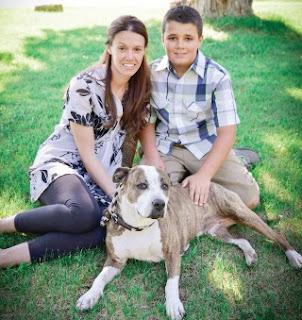 Gladish and Loveland-Dupuis will help act as advocates for their clients. “We can’t answer questions on the scans, but we can educate without crossing the line,” said Gladish. Dragonfly Integrative Health keeps its prices low and the services can run between $120 to $625 depending on the type of scan. Many get a baseline full body scan and a year later will go back for a follow up to see if anything has changed. Thermography is safe for all ages including children. 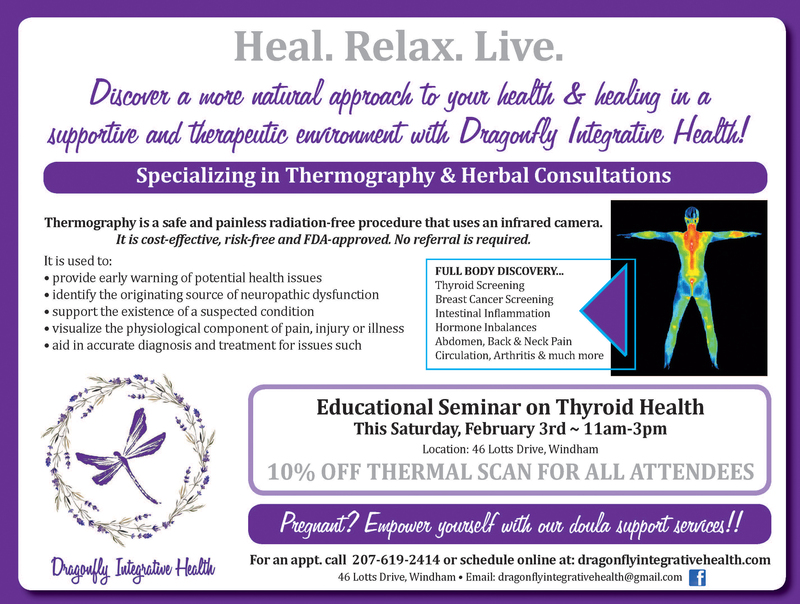 Dragonfly Integrative Health also travels to other area practices to share knowledge and do clinics with the thermography camera. The nearest is in Falmouth at Willow Woman’s Health, but they also go to Kennebunk to the Aim to be Well, T. Murray Wellness Center in Conway, NH and Greenwood Herbals in Limerick. For those who would like to use natural herbs to help with chronic or other issues, they will put together a program for their clients. With the use of herbs in teas, extracts and salves, Gladish and Loveland can help the sympathetic and para-sympathetic nervous systems find balance. The third service Dragonfly offers is taking care and empowering expectant and post-partum moms as doulas. The doulas work on a birth plan with the expectant mom about four weeks from the due date. They are on call from then until the baby is born. After, they offer post-partum visits to see how the child is doing at home with pets, to make sure the house is baby proofed and to check on the parents. The rate is a sliding scale to make the services readily available to people who need it, Loveland-Dupuis said. For more about Dragonfly Integrative Health, visit www.dragonflyintegrativehealth.com, email dragonflyintegrativehealth@gmail.com, call 207-619-2414 or find them on social media. They will be offering a class at their location at 46 Lott’s Drive in Windham on February 3 on thyroid health.